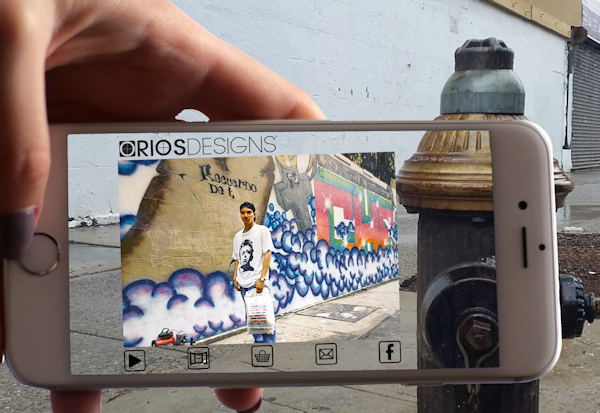 When Rios heard about Mi Querido Barrio, he volunteered to contribute his photographs from that time, which can now be viewed on residents’ smartphones. He believes AR technology can strengthen his community: “It is a great way to not only educate, but preserve and connect. I think that the more people start using it, especially the younger generation, the more they are going to open their eyes and want to reinvent,” he says. Nine Nights: African Burial Ground by Brooklyn-based Trinidadian artist Kearra Amaya Gopee demonstrates how AR can be used to make site-specific, if incorporeal, interactive art. The piece leads users on an introspective walk around the East 126th St. Bus Depot, which was actually a segregated burial ground for people of African descent during the 17th and 18th centuries. Throughout the neighborhood, artists have found innovative ways to reclaim public space, while putting history and art in the hands of residents. Tamiko Thiel, an artistic and technical adviser for Mi Querido Barrio, is known for creating guerrilla-style AR interventions. She trained artists on how to use the technology and helped workshop content. Thiel believes the medium’s subversive and democratizing potential, as it applies to public art and historical narratives, is the crux of its power. “You can really write alternative realities and alternative histories anywhere you want, anywhere that there is a community that doesn’t have enough power to commission big bronze statues of its heroes,” she says. Home, Memory and Future is at CCCADI through March 2017. Find out more about Mi Querido Barrio at CCCADI’s website.